The Ronald Reagan Presidential Library is the presidential library and burial site of Ronald Wilson Reagan, the 40th President of the United States (1981–1989), and his wife Nancy Reagan. Designed by Hugh Stubbins and Associates, the library is in Simi Valley, California, about 40 miles (64 km) northwest of Downtown Los Angeles and 15 miles (24 km) west of Chatsworth. The Reagan Library is the largest of the 13 federally operated presidential libraries. The street address, 40 Presidential Drive, is numbered in honor of Reagan's place as the 40th President. It was initially planned to build the Reagan Library at Stanford University, and an agreement was reached with the university in 1984. Those plans were canceled in 1987, and the freestanding site in Simi Valley was chosen the same year. Construction of the library began in 1988, and the center was dedicated on November 4, 1991. The dedication ceremonies were the first time in United States history that five United States Presidents gathered together in the same place: Richard Nixon, Gerald Ford, Jimmy Carter, Ronald Reagan himself, and George H. W. Bush. Six First Ladies also attended: Lady Bird Johnson, Pat Nixon, Betty Ford, Rosalynn Carter, Nancy Reagan, and Barbara Bush. Only Former First Lady Jacqueline Kennedy Onassis did not attend; but, her children Caroline Kennedy Schlossberg and John F. Kennedy Jr. were in attendance along with Luci Johnson Turpin, younger daughter of President Lyndon B. Johnson, as well as descendants of Franklin D. Roosevelt. When the Reagan Library opened, it was the largest of the presidential libraries, at approximately 153,000 square feet (14,200 m2). It held that title until the dedication of the William J. Clinton Presidential Center and Park in Little Rock, Arkansas, on November 18, 2004. With the opening of the 90,000-square-foot (8,400 m2) Air Force One Pavilion in October 2005, the Reagan Library reclaimed the title in terms of physical size; however, the Clinton Library remains the largest presidential library in terms of materials (documents, artifacts, photographs, etc.). Like all presidential libraries since that of Franklin D. Roosevelt, the Reagan Library was built entirely with private donations, at a cost of $60 million (equivalent to $101 million in 2018). Major donors included Walter Annenberg, Lew Wasserman, Lodwrick Cook, Joe Albritton, Rupert Murdoch, Richard Sills, and John P. McGovern. For fiscal year 2007, the Reagan Library had 305,331 visitors, making it the second-most-visited presidential library, following the Lyndon B. Johnson Library; that was down from its fiscal year 2006 number of 440,301 visitors, when it was the most visited library. As a presidential library administered by the National Archives and Records Administration (NARA), the Reagan Library, under the authority of the Presidential Records Act, is the repository of presidential records for Reagan's administration. Holdings include 50 million pages of presidential documents, over 1.6 million photographs, a half-million feet of motion picture film and thousands of audio and video tapes. The library also houses personal papers collections including documents from Reagan's eight years as Governor of California. The museum features continually changing temporary exhibits and a permanent exhibit covering President Reagan's life. This exhibit begins during Reagan's childhood in Dixon, Illinois, and follows his life through his film career and military service, marriage to Nancy Davis Reagan, and political career. The "Citizen Governor" gallery shows footage of Reagan's 1964 "A Time for Choosing" speech and contains displays on his eight years as governor. The gallery includes a 1965 Ford Mustang used by Reagan during his first gubernatorial campaign, as well as the desk he used as governor. His 1980 and 1984 presidential campaigns are also highlighted, as well as his inauguration suit and a table from the White House Situation Room is on display. News footage of the 1981 assassination attempt on his life is shown, and information about the proposed Strategic Defense Initiative (SDI, dubbed "Star Wars") is included. A full-scale replica of the Oval Office—a feature of most presidential libraries—is a prominent feature of this museum as well. Among the items Reagan kept on the Resolute desk, which is replicated in the exhibit, was a 16-inch-tall (41 cm) copy of a bronze statue of "Old Bill Williams", by B. R. Pettit; Williams was a renowned mountain man of Arizona. Other parts of the exhibit focus on Reagan's ranch, the presidential retreat Camp David, life in the White House, and First Lady Nancy Reagan. An example of a temporary exhibit that ran from November 10, 2007, to November 10, 2008 was titled "Nancy Reagan: A First Lady's Style" and had featured over 80 designer dresses belonging to Nancy Reagan. The hilltop grounds provide expansive views of the area, a re-creation of a portion of the White House Lawn, and a piece of the Berlin Wall. An F-14 Tomcat (BuNo 162592) is also located on the grounds. On November 8, 2007, Reagan Library National Archives officials reported that due to poor record-keeping, they are unable to say whether approximately 80,000 artifacts have been stolen or are lost inside the massive museum complex. A "near-universal" security breakdown was also blamed, leaving the artifacts vulnerable to theft. Many of the nation's presidential libraries claim to be understaffed and underfunded. NARA labeled the Reagan Library as having the most serious problems with its inventory. In an audit, U.S. Archivist Allen Weinstein blamed the library's poor inventory software for the mishap. Frederick J. Ryan Jr., president of the Ronald Reagan Presidential Foundation's board of directors, said the allegations of poor management practices at the library reflect badly on the National Archives. The library has undertaken a massive inventory project that will take years to complete. A 90,000-square-foot (8,400 m2) exhibit hangar serves as the setting for the permanent display of the Boeing 707 aircraft utilized as Air Force One during Reagan's administration. The aircraft, SAM 27000, was also used by six other presidents in its active service life from 1973 until 2001, including Richard Nixon during his second term, Gerald Ford, Jimmy Carter, George H.W. Bush, Bill Clinton, and George W. Bush. In 1990, it became a backup aircraft after the Boeing 747s entered into service and was retired in 2001. The aircraft was flown to San Bernardino International Airport in September 2001, where it was presented to the Reagan Foundation. In what was known as Operation Homeward Bound, Boeing, the plane's manufacturer, disassembled the plane and transported it to the library in pieces. After the construction of the foundation of the pavilion itself, the plane was reassembled and restored to museum quality, as well as raised onto pedestals 25 feet (7.6 m) above ground. The pavilion was dedicated on October 24, 2005, by Nancy Reagan, President George W. Bush and First Lady Laura Bush. SAM 27000 is part of a comprehensive display about presidential travel that also includes a Johnson-era Sikorsky VH-3 Sea King, call sign Marine One, and a presidential motorcade—Reagan's 1984 presidential parade limousine, a 1982 Los Angeles Police Department police car (as well as two 1980s police motorcycles), and a 1986 Secret Service vehicle used in one of President Reagan's motorcades in Los Angeles. The pavilion is also home to the original O'Farrell's pub from Ballyporeen in the Republic of Ireland that President and Mrs. Reagan visited in June 1984, now called the "Ronald Reagan Pub." Also featured are exhibits on the Cold War and Reagan's extensive travels aboard Air Force One. On June 9, 2008, Secretary of Education Margaret Spellings joined Nancy Reagan to dedicate the Reagan Library Discovery Center, located in the Air Force One Pavilion. The center is an interactive youth exhibit in which fifth through eighth grade students participate in role-playing exercises based on events of the Reagan administration. The pavilion has been used on several occasions as the venue for televised Republican Party primary-related debates (see below). The Reagan Library has hosted many events, including the funeral of Ronald Reagan in June 2004, and the first Republican presidential candidates' debate of the 2008 primaries. On May 23, 2007, Secretary of State Condoleezza Rice and Australian Foreign Minister Alexander Downer held a brief private talk and a press conference. On July 17, 2007, Polish President Lech Kaczyński presented Poland's highest distinction, the Order of the White Eagle, to Mrs. Reagan on behalf of her husband. Following his death, Reagan's casket was driven by hearse to the Reagan Library on June 7, 2004 from Point Mugu through a 25-mile-per-hour (40 km/h) procession down Las Posas Road to U.S. Highway 101. Many people lined the streets and freeway overpasses to pay final respects. A memorial service was held in the library lobby with Nancy Reagan, Reagan's children, close relatives, and friends. The Reverend Dr. Michael Wenning officiated at the service. From June 7 to 9, Reagan's casket lay in repose in the library lobby, where approximately 105,000 people viewed the casket to pay their respects. After flying the body to Washington, D.C., lying in state in the Capitol rotunda, and a national funeral service in the Washington National Cathedral, Reagan's casket was brought back to the library in California for a last memorial service and interment. Construction plans for the library included a tomb for the eventual use of Reagan and his wife. Following a sunset service on the library grounds the previous evening, early on the morning of June 12, 2004, Reagan was laid to rest in the underground vault. On March 6, 2016, Reagan's widow Nancy Reagan died at the age of 94 of congestive heart failure. After the funeral, she was buried next to her husband at the library on March 11, 2016. On May 3, 2007, the Ronald Reagan Presidential Foundation and Nancy Reagan hosted the first 2008 Republican primary debate in the library's Air Force One Pavilion. The candidates present included Kansas senator Sam Brownback, former Virginia governor Jim Gilmore, former New York City mayor Rudy Giuliani, former Arkansas governor Mike Huckabee, representative Duncan Hunter of California, senator John McCain of Arizona, representative Ron Paul of Texas, former Massachusetts governor Mitt Romney, representative Tom Tancredo of Colorado, and Tommy Thompson, former governor of Wisconsin and President George W. Bush's first secretary of Health and Human Services. Mrs. Reagan, California governor Arnold Schwarzenegger, and Fred Ryan, chairman of the Ronald Reagan Presidential Foundation were among those in attendance. Candidates discussed the Iraq War, the War on Terror, taxes, healthcare, abortion, stem-cell research, gay rights, illegal immigration, and made at least 20 references to Ronald Reagan and his presidency. On January 30, 2008, after the Republican candidates were narrowed to four—Romney, Huckabee, Paul, and McCain—the library was the scene of the final GOP debate, once again hosted by the Reagan Foundation and Mrs. Reagan. The library announced that it would once again host the first Republican primary debate among 2012 Republican candidates, initially scheduled for May 2, 2011, but later postponed it until after other debates. The debate was co-hosted by NBC News and Politico. The debate took place on September 7, 2011. In September 2015, the library hosted the second Republican presidential debate of the 2015-2016 cycle, run by CNN. 15 candidates took part in two sessions. The Ronald Reagan Presidential Foundation and General Electric (GE) announced a partnership beginning March 17, 2010, to support the two-year-long celebration of President Reagan's 100th birthday on February 6, 2011. GE, for whom Reagan hosted General Electric Theater and served as a goodwill ambassador from 1954 to 1962, prior to being elected Governor of California, served as the Presenting Sponsor of the historic Reagan Centennial Celebration. $10 million in the form of cash, advertising and promotion to support the Ronald Reagan Centennial Celebration, including funds to support the completely transformed, state-of-the-art museum at the Reagan Library that will be unveiled on February 5, 2011. This will include a new General Electric Theater that will focus on Reagan's career in radio, television, and film. 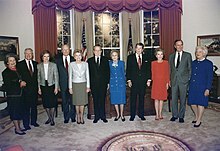 An additional $5 million to the Reagan Presidential Foundation to launch and support the GE–Reagan Scholars Program, an effort that will begin in 2011 and that will provide 200 four-year college scholarships over the next decade to "students who embody the vision and values personified by President Reagan." A donation from GE/NBC Universal to the Reagan Foundation of 208 restored episodes of General Electric Theater in which Ronald Reagan hosted or appeared from 1954 until 1962. The episodes, many of which were thought to be lost and some of which were damaged, were recently uncovered and restored to broadcast quality for purposes of the renovated Reagan Museum. An ad campaign and interactive Internet presence on GE's web site to promote the centennial and celebrate Reagan's political career and time with GE. A series of public affairs lectures with Reagan-era luminaries that focused on Reagan's legacy. The Reagan Centennial was also being led by the National Youth Leadership Committee. Notable members of the Committee include chairpersons Nick Jonas, Jordin Sparks and Austin Dillon, as well as famous non-chairpersons, including actress Anna Maria Perez de Tagle, Olympic bronze medalist Bryon Wilson, Olympian and X-Games medalist Hannah Teter, and recording artist Jordan Pruitt. Several other Olympians and athletes are also members of the Committee. ^ Hufbauer, Benjamin (December 1, 2008). "The Ronald Reagan Presidential Library and Museum. Simi Valley, Calif. http://www.reaganlibrary.com". Journal of American History. 95 (3): 786–92. doi:10.2307/27694381. Retrieved February 23, 2013. ^ Lopez, Natalina (July 1, 2016). "How Will the Obama Presidential Library Stack Up?". Town and Country Magazine. Hearst Communications, Inc. Retrieved March 3, 2017. Perched on a hillside in Simi Valley, California, the Reagan Library wins the prize for being the largest of the presidential libraries. ^ "Reagan Library at Stanford OK'd". Milwaukee Journal. February 15, 1984. Archived from the original on January 24, 2013. Retrieved November 28, 2012 – via Google News. ^ Turner, Wallace (February 15, 1984). 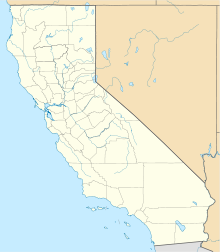 "Stanford to be the Site of the Reagan Library". New York Times. ^ Lindsey, Robert (April 24, 1987). "Plan for Reagan Library at Stanford Is Dropped". The New York Times. Retrieved August 24, 2012. ^ "Museum". Ronald Reagan Presidential Foundation. Archived from the original on November 18, 2007. Retrieved November 19, 2007. ^ a b c Mydans, Seth (November 1, 1991). "Elite Group to Dedicate Reagan Library". The New York Times. Retrieved November 19, 2007. ^ a b Giller, Melissa (2003). "Reagan Presidential Library". In Drake, Miriam A. Encyclopedia of Library and Information Science. 4. CRC Press. p. 2456. ISBN 0-8247-2080-6. ^ "Winds Tear Air Force One Pavilion Roof at Reagan Library". Ventura County Star. November 3, 2007. Archived from the original on January 3, 2008. Retrieved November 20, 2007. ^ "Library Museum and Information". Clinton Presidential Library and Museum. Archived from the original on November 17, 2007. Retrieved November 20, 2007. ^ Presidential Libraries on C-SPAN: Exclusive Series Interviews and Additional Footage (Documentary). C-SPAN. November 30, 2007. Event occurs at 1:32:03, 1:32:55. Retrieved October 14, 2011. ^ a b c "Archives: The Ronald Reagan Presidential Library". National Archives and Records Administration. Retrieved November 20, 2007. ^ "Early Years Gallery". Ronald Reagan Presidential Foundation. Archived from the original on February 8, 2007. Retrieved October 14, 2011. ^ "Citizen Governor Gallery". Ronald Reagan Presidential Foundation. Archived from the original on February 8, 2007. Retrieved October 14, 2011. ^ "New Beginnings Gallery". Ronald Reagan Presidential Foundation. Archived from the original on February 8, 2007. Retrieved October 14, 2011. ^ "The Oval Office". Ronald Reagan Presidential Foundation. Archived from the original on February 8, 2007. Retrieved October 14, 2011. ^ "Old Bill Williams sculpture". Arizona Highways: 38. May 1985. WPS33940. ^ "The President's Residences". Ronald Reagan Presidential Foundation. Archived from the original on February 8, 2007. Retrieved October 14, 2011. ^ "First Lady Nancy Reagan". Ronald Reagan Presidential Foundation. Archived from the original on February 8, 2007. Retrieved October 14, 2011. ^ Corcoran, Monica (November 11, 2007). "The Nancy Years". Los Angeles Times. Retrieved October 14, 2011. ^ Bakalis, Anna (November 9, 2007). "Style Exhibit Chronicles Nancy Reagan's Life". Ventura County Star. Archived from the original on March 5, 2009. Retrieved November 22, 2007. ^ "Calendar of Events". Ronald Reagan Presidential Foundation. Archived from the original on August 22, 2007. Retrieved December 2, 2007. ^ LACEY, MARC (January 18, 1991). "Stemming the Tide : Endangered Plant Has Knack of Blocking Construction". LA Times. Retrieved 17 January 2018. ^ a b Chawkins, Steve & Salliant, Catherine (November 9, 2007). "The Talk of the Reagan Library". Los Angeles Times. Retrieved October 14, 2011. ^ a b c Alonso-Zaldivar, Ricardo & Salliant, Catherine (November 10, 2007). "Reagan Library Has Lost Thousands of Artifacts". Tampa Tribune. Archived from the original on March 5, 2009. Retrieved November 21, 2007. ^ "Air Force One Pavilion". Ronald Reagan Presidential Foundation. Archived from the original on November 20, 2007. Retrieved November 23, 2007. ^ a b "Facts and Stats". Ronald Reagan Presidential Foundation. Archived from the original on November 7, 2007. Retrieved November 23, 2007. ^ a b "Reagan Air Force One Moves to Presidential Library" (Press release). Boeing. June 20, 2003. Archived from the original on December 13, 2007. Retrieved December 3, 2007. ^ "The Journey of Air Force One". Ronald Reagan Presidential Foundation. p. 3. Archived from the original on August 22, 2007. Retrieved December 3, 2007. ^ Bush, George W. (October 21, 2005). President Participates in Opening Ceremony for Air Force One Pavilion (Speech). Simi Valley, California. Retrieved November 23, 2007. ^ a b "Permanent Galleries". Ronald Reagan Presidential Foundation. Archived from the original on November 21, 2007. Retrieved November 23, 2007. ^ "Permanent Galleries: Presidential Motorcade". Ronald Reagan Presidential Foundation. Archived from the original on August 14, 2007. Retrieved November 23, 2007. ^ Carlson, Cheri (June 9, 2008). "'Unmatched Creativity' at Reagan Library's Discovery Center". Ventura County Star. Archived from the original on June 10, 2008. Retrieved June 15, 2008. ^ Serjeant, Jill (May 23, 2007). "Rice, Australian Minister Evoke Reagan in Iraq Talk". Reuters. Retrieved November 23, 2007. ^ Nasby, Robin (July 27, 2007). "Rare Visit from Polish President Draws Far-Off Visitors to Simi". Simi Valley Acorn. Retrieved October 14, 2011. ^ "Transcripts: American Morning". CNN. June 10, 2004. Retrieved October 14, 2011. ^ Welzenbach, Dennis (June 7, 2004). "Burial of a President: A Behind the Scenes Diary". Suhor Industries. Archived from the original on September 1, 2012. Retrieved October 14, 2011. ^ Sewell, Abby (March 6, 2016). "Nancy Reagan: Visitors pay their respects at the presidential library in Simi Valley". Los Angeles Times. ^ Nagourney, Adam & Santora, Marc (May 4, 2007). "Republicans Differ on Defining Party's Future". The New York Times. Retrieved October 14, 2011. ^ "Romney Blasts McCain over Iraq War Charge". Fox News. Associated Press. January 30, 2008. Archived from the original on 2008-10-11. Retrieved January 31, 2008. ^ Camia, Catalina (November 11, 2010). "Nancy Reagan to Host Debate for 2012 GOP Hopefuls". USA Today. Archived from the original on February 4, 2012. ^ Hendin, Robert (March 30, 2011). "First Republican presidential debate postponed". CBS News. ^ "The Republican Debate at the Reagan Library". New York Times. September 7, 2011. ^ Hohmann, James & Isenstadt, Alex (January 16, 2015). "2016 Presidential Debate Schedule: Republican Party rolls out dates". Politico. ^ "Ronald Reagan Presidential Foundation Announces GE as Presenting Sponsor of the Ronald Reagan Centennial Celebration" (Press release). General Electric. March 17, 2010. Archived from the original on September 26, 2011. ^ Jackson, David (August 3, 2010). "Ronald Reagan Centennial Includes Youth Leadership". USA Today. Retrieved October 14, 2011. Wikimedia Commons has media related to Ronald Reagan Presidential Library.